The ancient city Patan is situated 5km Southeast of Katmandu, nowadays it is difficult to seperate it from Kathmandu itself, although the pace of life here is decidely slower.It is known as the city of fine arts and the city is full of Hindu temples and Buddhist monuments. The diversity of the medieval culture provides a real blend between both Hinduism and Buddhism.It is referred to by the locals as Lalitpur which means city of beauty. The city has a long Buddhist history and the four corners of the city are marked by stupas. 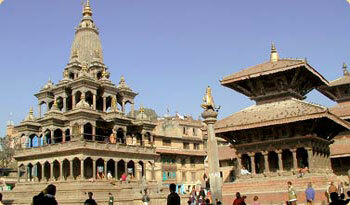 The central Durbar Square is absolutely packed with temples. It is an architectural feast, with a far greater concentration of temples per sq meter than either Kathmandu or Bhaktipur. Numerous other temples built in widely diverse styles along with many Buddhist monasteries are scattered around this fascinating town. The Patan Durbar square alone is generaly recognised to be the most visually stunning display of Newari architecture to be seen in Nepal. Was built in the 16th century by late King Siddhi Narsingh Malla and the temple is made entirely stone except for the few pinnacles or spires that are made out of metal. The carvings on its friezes depict battle scenes from the ancient Hindu epics of South Asia, the Ramayan and the Maha-Varat in particular. Opposite the Krishna Mandir there is a single stone pillar with a Garuda (the god of flight) sitting aloft and paying homage to Lord Krishna. Located inside kwabadehal, this three storey golden pagoda of Lokeshwor (Lord Buddha) was built in the twelth century by king Bhaskar Verma. Inside the upper storey of the pagoda, is a golden image of Lord Buddha and a large prayer wheel. This unique Buddhist monastery contains a fine collection of images and statues in metal, stone and wood. It is believed that the Kings in ancient times were crowned in this monastery. Many of the treasures offered by the devotees can be seen here today. There are four ancient stupas popularly believed to have been built in 250 B.C. by Emperor Ashoka at the four corners of Patan. The four stupas are situated in Pulchowk, Lagankhel, Ebahi and in Teta respectively. These stupas give evidence to the city’s ancient religious importance. Lies a little further east from Patan Durbar Square, this Buddhist temple is made of clay bricks in which thousands of images of Lord Buddha engraved. The terra-cotta structure is one of the fourteenth century Nepalese architectural masterpieces. The twin villages of Bungamati and Khokana date from 16th century and are typical ancient Newar Villages, they are situated around five kms from Patan and it is well worth considering tagging on these villages if you are visiting Patan. They villages are located south of Kathmandu down a rutty road dotted with chaityas, appropriate for an ancient procession route. Bungamati is famous as the winter home of the Red Machhendra god of Patan who resides every winter in a powerful, Shikhara-style temple. Its spacious courtyard is often used for spreading grain to dry in the sun.